This is the Boho Retreat 4 drawer chest that offer so much storage space whether in a bedroom, hallway, lounge or even an office. The top drawer have a patterned frieze of blind fret work all along them that add a unique ethnic look. The woods used in the construction are Mango solids with the inlaid effect made from veneers of teak, mahogany & mindy ash. 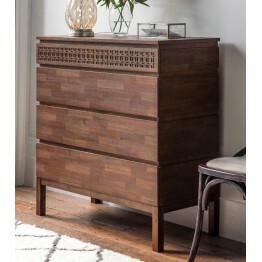 This is such a useful chest of drawers that looks stunning in any home and rather unique too. The colour in this Boho Retreat range is a medium brown warm shade.